10 Things I Love About You!! Last year around this time, I was absolutely flat broke (I was new to this Province and was still not employed….). Since I am a lover of Valentine’s Day and needed a gift for my sweetie, I knew I only had one choice -I had to make the gift. It had to be meaningful, yet cheap :). I came up with the 10 Things I Love About You Jar….. The jar was pretty easy to put together. 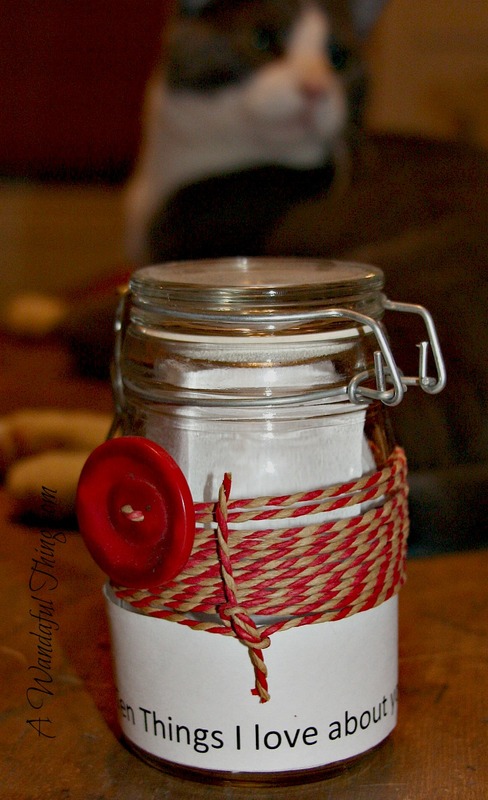 I already had the jar (it is from the Bulk Barn), I also already had the twine. The button was donated to me by my landlady at the time, so then I only had to print off the label and write out 10 reasons why I love my guy (it was pretty easy). Since my handsome kitty was so involved in the photo shoot, I decided to include him in this post. My guy loved the jar and told me he thought it was A Wandaful Thing!! This entry was posted in Decorate, DIY and tagged cheap, crafts, creativity, Decorate, DIY, easy, free, gift, ideas, inexpensive, jar, reuse. Bookmark the permalink.